Welcome to a special week of “Cheaters and Thieves” stories here at Flushdraw, kicking off with a look at two stories which involve the US-facing grey market site BetOnline. The first and most salacious involves the posting of an online blackjack video from a BOL player which appears to show the dealer cheating. BOL is part of the flourishing new generation of online “live dealer casinos” that feature a host of the most popular table games. 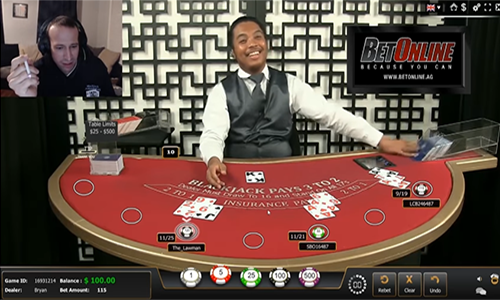 In the blackjack games, oversized cards are used at a regular blackjack table, and the action is filmed; players participate for real money by computer. Following that, in a second post, we’ll touch on the rumors also involving BOL that convicted “Black Friday” felon Brent Beckley has returned to the industry, and at that, to a management gig at BetOnline. Between the two salacious stories, BOL’s reputation is taking a bit of a hit in recent days. How deserved that hit is is always up to the reader and his perspective. As the week continues — and yes, we’re burying the lede a bit, but bear with us — we’ll offer several more “Cheaters and Thieves” stories in addition to our regular content. We actually led off last week with a return to the Jeremy Johnson / Black Friday saga as it’s been playing out as part of the high-profile trial of former Utah Attorney General John Swallow. Buried amid that trial’s morass of detail are the still unanswered allegations of Johnson directing a $2 million bribe (initial allegations said $1 million) to US Sen. Harry Reid on behalf of the original, now-defunct Full Tilt Poker. Here, though, the burgeoning BetOnline mess. Buckle in. The meat of the incident gets a slow-motion treatment, where it’s clear that the dealer flicks up the top card in the shoe, then gives the second card (a six) to the player, who has split deuces against dealer’s king(!) and already busted the first half of the doubled bet; the jack you see is the top of the first deuce’s bust cards, neatly stacked. The dealer then gets what was the original top card in the shoe (an eight), making 18 to player’s 17 and winning both halves of the split. Now here’s the thing: One never-ever-ever splits deuces against a ten-counter in basic blackjack strategy, no matter how many decks are in the shoe. But the player making the bet — not Morgenstern per his claims, but “one of [his] fans” — forwarded the video after discovering the probable cheat. Morgenstern, a self-admitted card counter, sometimes employs unusual, against-normal-odds strategies in situations where the “count” is either very high (positive) or very (low). It’s likely that this “fan” of Morgenstern’s is also a card counter using unusual strategy at select moments. Note that this was a veteran player, as seen from the site’s perspective, who was betting $100 a hand. This is a blackjack whale by normal online standards. Take that into account, and splitting those deuces against the king is a dead-bang indication that the player is a card-counter of some type, employing that unusual strategy. We recommend watching the video of the hand in which the alleged cheating occurred. (Warning on audio: Morgenstern is a bit brusque and foul-mouthed, which is what one would expect from someone who spent over seven years in a federal pen after an armed bank robbery in Maine; Google “Kenneth Morgenstern” for details. Stupid-criminal alert: Hilarious bit about ski masks available here.) There is no question that the dealer flicks the top card up and grabs the second card, giving that to the player, a probable card counter. It was an intentional cheat orchestrated between the dealer and the parent site (BOL) in an effort to boost operational profits, likely by winning a few extra hands from high-wagering players. Such company-orchestrated cheats have occurred throughout all of online gambling’s history, sad to say. No one outside BetOnline knows for sure at this juncture, but the odds are high that this was an intentional cheat of some form, and not #1 above (dealer error), the odds of which I would put at less than 5%. People who have watched the video repeatedly, focusing on the dealer’s left hand, notice that his index finger flicks twice across the back of the top card before he flips it upwards with his fingernail to grab the second card. My belief is that the flicking is part of the cheat. Most likely, there are bumps or marks on each card’s back in that spot, indicating each card’s value, and the dealer knew that the true next card (the eight), would give the player a nice 20. Those index-finger movements aren’t “twitches”, but are instead likely a stroking movement to detect physical marks on the top card. Having felt the marking, he takes his chance on the next card, which is unlikely to be another eight or nine, the two values most harmful to the house’s odds. In other words, it’s likely a cheat done to improve the odds but not necessarily cinch the hand for the host site. And that leads to more questions. Was it the dealer acting alone, or was BOL also involved? Of the three options (#2-4 above) that involve an intentional cheat, I’d rate #3 most likely. It appears to be an attempt to swipe some money back from a winning player, which they likely thought they’d get away with due to the low-definition video quality of most of these types of operations. Except they didn’t, if this scenario is indeed the right one. Second most likely, in my opinion, is that this was a cheat independently orchestrated by the dealer himself. The “why,” though, would be less clear: What does the dealer have to gain? Perhaps the site has an incentive program for high-performing dealers who generate lots of profit for the site. The problem with this theory, though, is that if the cards are marked, who did the marking? Those are specialized, oversized cards without much use except for online play, and it’s hard to believe they’d be left in the hands of individual dealers to alter at will. Could be, though… one never knows quite what to expect in this world. It’s also somewhat less likely that this is part of an ongoing BOL blackjack cheat that’s targeting all players over time. We say that noting that if BOL tried to pull a fast one against an inferred card counter, the ethics (or lack thereof) are just about the same. It’s likely that other online blackjack players are scouring other videos of online play at BOL looking for other dealer cheats, looking for similar incidents. To the best of my knowledge, none of yet been uncovered. What should one expect? First off, I’d be highly surprised if the unidentified dealer appeared any time soon at BetOnline’s “live delaer” tables. Odds are that something happened, and he’s either been dumped or moved to a not-in-front-of-the-camera position. Beyond that, we may never know. Caveat emptor! And check back soon for the Beckley piece as well.